April is Distracted Driving Awareness Month and authorities are reminding drivers to put away the distractions and stay focused on the road. The Insurance Council of Texas said in a statement Tuesday that distracted driving remains a very serious problem on Texas roads. According to information from the Texas Department of Transportation, 1 in 5 crashes involve distracted driving. Discussions on distracted driving often focus on cell phone use, but by definition, distracted driving is any activity that diverts attention from driving. In 2017, according to TXDOT, 19 percent of vehicle crashes on Texas roads involved distracted driving. Those 100,687 crashes resulted in 444 deaths and 2,889 serious injuries. Similarly, according to information from the National Highway Traffic Safety Administration, 3,166 people were killed in distraction-affected crashes across the country. Earlier this year, ICT reported that Texas traffic fatalities had declined by 4 percent in 2018, the first such decline since 2010. But despite the decline, Texas remains among the highest in the nation in the number of traffic fatalities and we need to do more to continue reducing this number. Throughout April, many ICT member companies will be educating on the dangers of distracted driving, urging drivers to stay focused on the roads, and curb distracted driving habits. Houston-area drivers can expect easier commutes if more than two dozen major Texas Department of Transportation projects make their estimated completion dates in 2019. 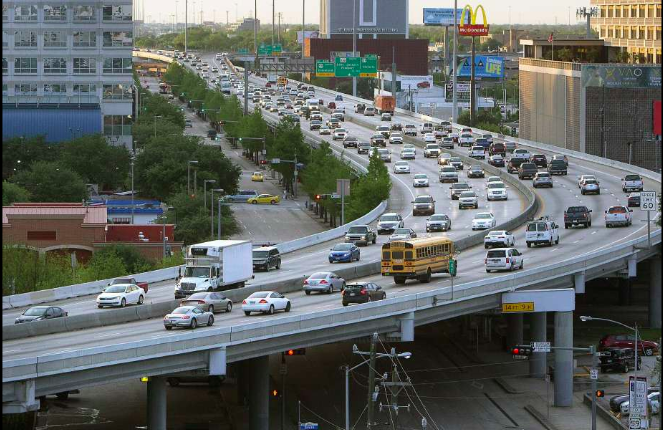 Close to 30 transportation projects, each with budgets of at least $3 million, are expected to finish some time this year according to information from seven offices in TxDOT's Houston district. The most expensive projects are located primarily along U.S. Highway 290, one of many traffic hotspots in the city. The five 290 projects, all of which are lane-widening operations in the West Harris County area, have a combined cost of $260 million. Siemens Mobility has announced the opening of its new Digital Lab for intelligent transportation systems (ITS). The lab, located in Austin in Texas, USA, will monitor, collect and analyze data to enhance the development of important digital urban mobility technologies. Key focus areas will be new technologies such as connected vehicles, self-driving vehicles, advanced traffic management systems, multimodal transportation, shared mobility, electric bike sharing and fleet management. “The amount of data that we are now collecting from various traffic technologies and intelligent infrastructure is extremely valuable for transport operators,” said Marcus Welz, president of Siemens Intelligent Traffic Systems in the USA. The new center features an open layout supportive of design thinking methodologies needed for rapid prototyping and co-creation with customers. The Lab will primarily house data engineers, software developers and data scientists who are experts in machine learning and artificial intelligence. Gas prices have jumped 29 cents in Texas in just one month, according to AAA officials, who say drivers can expect to pay more into summer. AAA reports Texas drivers are paying $2.47 a gallon on average for regular unleaded fuel. In Houston, it costs $2.48 per gallon on average to fill up, 20 cents lower than the national average of $2.68. AAA says higher demand and tighter supply pushed prices up in March. They predict prices will climb to $2.75 a gallon by summer nationwide. "If you're on the west coast, you could see it increase a bit more, but more states and in the southern part of the country will definitely see that 10-cent increase,” said Jeanette Casselano, a spokesperson for AAA. Of the 2.3 million suspensions in Texas, the bulk of them, 1.5 million, come from DPS’ Driver Responsibility Program, which imposes surcharges on top of fines for traffic citations, often leading to a suspension. Those surcharges recur annually for three years and can create financial hurdles for drivers looking to reinstate their licenses, the study argues, because they can’t afford them. The vast majority of those suspensions, the study found, were the result of citations for driving without a valid license or driving without insurance – not public safety-related citations like driving while intoxicated or speeding. While Texas lawmakers initially intended for the compounding fines and suspensions to keep dangerous drivers and repeat offenders off the roads, study co-author Mary Mergler with Texas Appleseed says the lion’s share of suspensions impact low-income drivers who simply can’t pay the compounding fines and surcharges, which range from $100 to $250 per year for up to three years after a ticket. "It prevents people from not only earning the money that they need to pay off those fines and surcharges, but also just earning a living to support their families," Mergler said. A budget bearing the best news in 13 years for Texas’ more than 5 million schoolchildren — as well as some plums for North Texas — cleared the House early Thursday. A nearly 16 percent increase in state funding of prekindergarten through 12th grade would boost classroom funding. Other increases would put the brakes on retired teachers’ rising health insurance premiums and give them their first cost-of-living increase in years. The education gains would coincide with tax relief for homeowners and businesses. The tax cuts, though, would require passage of a House school-finance plan. “This is an extraordinary budget,” boasted House Appropriations Committee Chairman John Zerwas. Credit goes to an “incredibly prosperous” Texas economy, said Zerwas, a Richmond Republican who again is the chamber’s top budget writer. Let’s imagine you have been immersed in reading yet another Express-News editorial. This time it’s about traffic tickets. Who knew there was so much to learn about something so mundane? It is such an interesting and well-written editorial you forget about that 9 a.m. meeting with your boss. You snap out of it at 8:55 a.m. and race out the door. You are speeding down the road, and you just might be fashionably late, but a San Antonio police officer pulls you over for speeding. Busted. The officer is polite and friendly but still writes you a big, fat ticket. Man, what a crummy morning, but you can pay the fine and life goes on. But what if you can’t pay the ticket? The Texas Legislature is considering a bill to change how the state handles driver license tests for those under the age of 18. For years, students who had their parents teach them to drive could have the test waived in favor of a parent-led test. But the state legislature made a change to the Texas Transportation Code in 2009, requiring individuals younger than 18 take a test administered by the Texas Department of Public Safety. State Representative James White, a Republican who represents District 19 in the area around Woodville, has filed a bill to reverse the current law and allow individuals under 18 to have the test waived. It comes as no surprise that San Antonio tops the list as the most stressed city in Texas when it comes to driving in traffic. BabylonHealth has released its list after analyzing Twitter content to find out where people are most likely to tweet about stress, anxiety and frustration while driving. They used a tool called TensiStrengh to estimate stress levels of tweets using certain words. San Antonio had a whopping 11.62 percent of people publishing “stressed” tweets. Houston was not far behind with 11.60 percent. Overall, Texas came in at number 12 of the most stressed states.